Many cultures around the world have stories about this star cluster that contains seven stars, although one is very faint. These representative stories are from wikipedia. 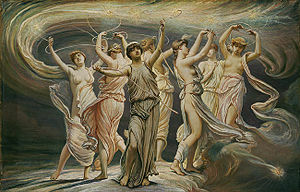 The seven dancing sisters of the Pleiades. Our name for the star cluster comes from the Greeks. The Pleiades, companions of Artemis, were the seven daughters of the titan Atlas and the sea-nymph Pleione,born on Mount Cyllene. They are the sisters of Calypso, Hyas, the Hyades, and the Hesperides. The Pleiades were nymphs in the train of Artemis, and together with the seven Hyades were called the Atlantides, Dodonides, or Nysiades, nursemaids and teachers to the infant Bacchus. Maia, eldest of the seven Pleiades, was mother of Hermes by Zeus. Electra was mother of Dardanus and Iasion, by Zeus. Taygete was mother of Lacedaemon, also by Zeus. Alcyone was mother of Hyrieus, Hyperenor and Aethusa by Poseidon. Celaeno was mother of Lycus and Eurypylus by Poseidon. Sterope (also Asterope) was mother of Oenomaus by Ares. Merope, youngest of the seven Pleiades, was wooed by Orion. In other mythic contexts she married Sisyphus and, becoming mortal, faded away. She bore to Sisyphus several sons. But many other cultures also have stories about these stars. To the Vikings, the Pleiades were Freyja‘s hens, and their name in many old European languages compares them to a hen with chicks. To the Bronze Age people of Europe, the Pleiades were associated with mourning and with funerals, since at that time in history, on the cross-quarter day between the autumn equinox and the winter solstice (see Samhain, also Halloween or All Souls Day), which was a festival devoted to the remembrance of the dead, the cluster rose in the eastern sky as the sun’s light faded in the evening. As a result of precession over the centuries, the Pleiades no longer marked the festival, but the association has nevertheless persisted, and may account for the significance of the Pleiades astrologically. In Western astrology they represent coping with sorrow and were considered a single one of the medieval fixed stars. As such, they are associated with quartz and fennel. In esoteric astrology the seven solar systems revolve around Pleiades. 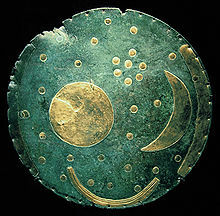 The Nebra sky disk, dated c. 1600 BC. 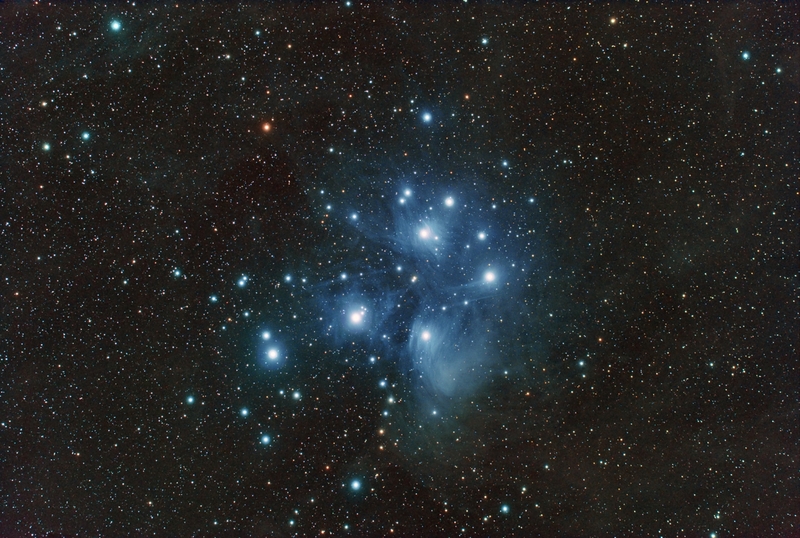 The cluster of dots in the upper right portion of the disk is believed to be the Pleiades. In Ukrainian traditional folklore the Pleiades are known as refer to the female tribal deities. Accordingly to the legend, seven maids lived long ago. They used to dance the traditional round dances and sing the glorious songs to honor the gods. After their death the gods turned them into water nymphs, and, having taken them to the Heavens, settled them upon the seven stars, where they dance their round dances, In Ukraine this asterism was considered a female talisman until recent times. In the ancient Andes, the Pleiades were associated with abundance, because they return to the Southern Hemisphere sky each year at harvest-time. InQuechua they are called collca’ (storehouse). The ancient Aztecs of Mexico and Central America based their calendar upon the Pleiades. Their year began when priests first remarked the asterism heliacal rising in the east, immediately before the sun’s dawn light obliterated the view of the stars. Aztecs called the Pleiades Tianquiztli (meaning “marketplace”). Paul Goble, Native American storyteller, tells a Blackfoot legend that he says is told by other tribes as well. In the story, the Pleiades are orphans (“Lost Boys”) that were not cared for by the people, so they became stars. Sun Man is angered by the mistreatment of the children and punishes the people with a drought, causing the buffalo to disappear, until the dogs, the only friends of the orphans, intercede on behalf of the people. Because the buffalo are not available while the Lost Boys are in the skies, the cosmical setting of the Pleaides was an assembly signal for Blackfoot hunter to travel to their hunting grounds to conduct the large-scale hunts, culminating in slaughters at buffalo jumps, that characterized their culture. 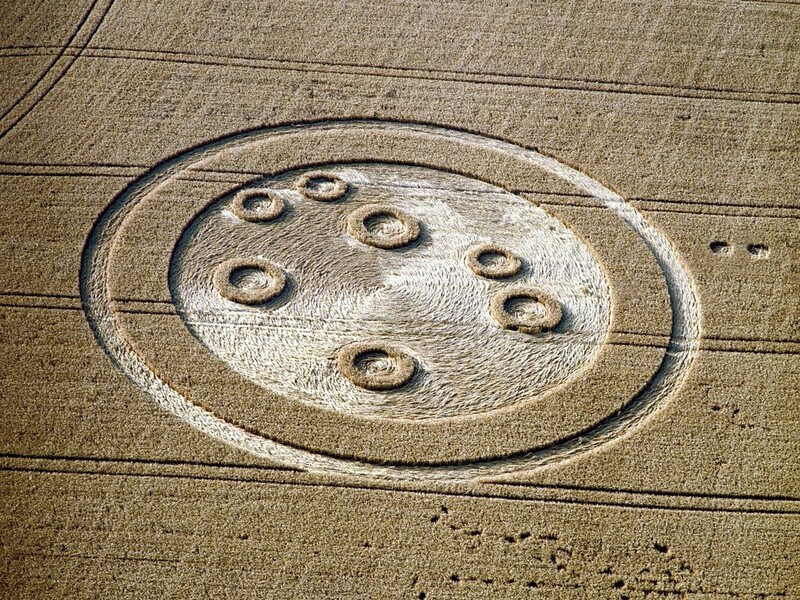 1994 Froxfield, England, crop circle of the seven sisters. A Cherokee myth (similar to that of the Onondaga people) indicates that seven boys who would not do their ceremonial chores and wanted only to play, ran around and around the ceremonial ball court in a circle, and rose up into the sky. Only six of the boys made it to the sky; the seventh was caught by his mother and fell to the ground with such force that he sunk into the ground. A pine tree grew over his resting place. The Hopi built their underground kivas for multiple utilitarian uses, the most important of which was a ceremonial meeting place. Access was through a ladder in a small hole in the roof of the kiva, and during certain ceremonies, the night passage of the Pleiades over the center of the opening was a direct signal to begin a certain ceremony. Most of the cultures used the angle of the Pleiades in the night sky as a time telling device. The Lakota Tribe of North America had a legend that linked the origin of the Pleiades to Devils Tower. According to the Seris (of northwestern Mexico), these stars are seven women who are giving birth. The Monache people tell of six wives who loved onions more than their husbands and now live happily in “sky country”. The early Monte Alto Culture and others in Guatemala such as Ujuxte and Takalik Abaj, made its early observatories, using the Pleiades and Eta Draconis as reference, they were called the seven sisters, and thought to be their original land. 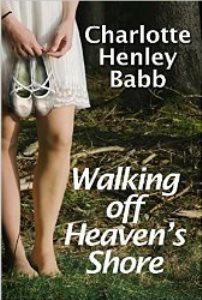 A Nez Perce myth tells of one sister who falls in love with a man and, following his death, is so absorbed by her own grief that she tells her sisters about him. They mock her tell her how silly it is of her to feel sad for the human after his death, and she in return keeps her growing sadness to herself, eventually becoming so ashamed and miserable about her own feelings that she pulls the sky over her face like a veil, blocking herself from view. This myth explains why there are only six of the seven stars visible to the naked eye. The Onondaga people‘s version of the story has lazy children who prefer to dance over their daily chores ignoring the warnings of the Bright Shining Old Man. The Shasta people tell a story of the children of racoon killed by coyote avenging their father’s death and then rising into the sky to form the Pleiades. The smallest star in the cluster is said to be coyote’s youngest who aided the young racoons. In Chinese constellations, they are 昴 mao, the Hairy Head of the white tiger of the West. In Japan, the Pleiades are known as 昴 Subaru which means “coming together” or cluster in Japanese, and have given their name to the car manufacturerwhose logo incorporates six stars to represent the five companies that merged into one. Subaru Telescope, located in Mauna Kea Observatory on Hawaii, is also named after the Pleiades. In Theosophy, it is believed the Seven Stars of the Pleiades focus the spiritual energy of the Seven Rays from the Galactic Logos to the Seven Stars of theGreat Bear, then to Sirius, then to the Sun, then to the god of Earth (Sanat Kumara) and finally through the seven Masters of the Seven Rays to us. In Ufology some believers describe Nordic alien extraterrestrials (called Pleiadeans) as originating from this system. A contactee named Billy Meier claims to have met with them. In New age, some believe that Sun and the Earth will pass through a Photon belt from the Pleiades, causing a cataclysm and/or initiating a spiritual transition (referred to variously as a “shift in consciousness,” the “Great Shift,” the “Shift of the Ages”). This entry was posted in Babbling, Sevens, Ultimate Blog Challenge and tagged seven sisters, star cluster mythns, The Pleiades. Bookmark the permalink. Very interesting. In a broad cultural way, this represents one of the statements in my blog post today that “nothing has a meaning until you give it one.” In your blog, all these different people in different parts of the world and most likely for good reasons at the time, each gave this same physical Universe cluster of stars different names and meanings. I like that idea: “Nothing has meaning until you give it one.” Thanks for stopping by. Cool. I never realized how many stories are attached to the star. Thanks! 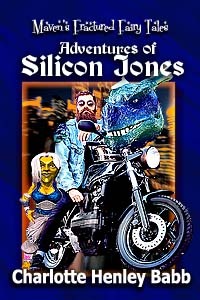 I was surprised by how many different stories there are. Lots of different ideas. Thanks for stopping by. So, if I ask for a Subaru, I’m not talking about a car? Again, great post on 7’s. I mention the Artemis group in the context of warrior women on a post a couple of months ago somewhere. Depends on where you are, I guess. But then, anytime you ask for something, it depends on where you are. The Pleides are the fallen angels who mated with women and gave birth to the Nephilim, and are bound there until Judgment Day.